Is it true that it's not needed anymore these days? I was told I could just install a VAC-check plugin on the server instead of the whole SMAC package, but it sounds really dumb to me. Also, I know quite a few players that have cheated on non-source games but are clean on CS:GO for example. Banning them just for a VAC they got years ago when they were stupid kids and were playing another game doesnt sound smart to me. The most resource heavy module is probably the Anti-Wallhack module, but since your signature indicate CS:GO, then the Anti-Wallhack module won't work for you, and you should instead use the built-in "sv_occlude_players" setting of CS:GO. I would personally still keep things such as the ConVar Checker, to check and ban people changing client cvars locally that gives "cheating" effects, such as e.g. sv_cheats 1. VAC checking and banning cross different engines is as you say, ... some people may have done bad things in the past, but have turned better now.. Most of the people that are referring to it as "heavy", "outdated" and/or "not required anymore" are most likely people that are not satisfied, because they cannot activate their wanted cheats properly on your server. That attitude seems to be very common. Lets put it this way ... in the past 2 weeks SMAC has banned 3 players from our server and in each case they were VAC banned the following day. I'd say it is still useful. So you'd say keeping all these modules is fine? The ban lists don't work anymore to my experience, but other than that, you're good! You can view the wiki to check the plugin. sv_occlude_players isn't what you're thinking it is, occlusion is when a player is up against a door their arms and legs wont protrude from the door on the other side. 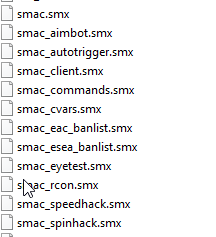 I think the message is quite clear - the built-in sv_occlude_players does exactly the same function as SMAC's anti-wallhack module (doesn't network occluded players). This is entirely server-side functionality, just because it's built-in instead of a plugin doesn't mean players can bypass it.